Do you have a special place? Somewhere away from home that transcends all others. Somewhere that despite the wonders of the world you may have seen always draws you back. Time after time. Year after year. A place where whatever the weather, the season, or your circumstances seems to hold out a welcome that envelops your consciousness. A very personal experience that others may not see the same way. If you have you are very, very lucky. Bobby has in Pembrokeshire, West Wales. Britain’s only coastal national park. A coast path of 186 miles through the most glorious coastal scenery imaginable. St Brides Bay. St Davids. The list goes on. Bobby first went there in 1986 and was confronted by a horizontal driven sea mist so dense you could hardly see a thing. The following day the mist was still there. Come the third day to the same view it would have been easy to say. “Lets go home. This is awful”. But he persevered. Later that day driving down to where the sea should have been the sky suddenly lifted. The sun tried to break through. Leaving a strange beautiful vista where land, sea and sky melted into one translucent picture where across the middle the islands were strung out like a string of pearls. Thirty years later he has never seen that view again. It was love at first sight. The coast path and most memorably a trip to Skomer Island. As the years went by family holidays were followed by twenty years volunteering on Skomer . Introducing family and friends who all became volunteers too and will never forget the weeks they spent living on an island. And at other times backpacking the coast path staying in youth hostels. Time and tide stand still for no man and it became clear that working holidays and backpacking were less attractive as age advanced. Illness came. 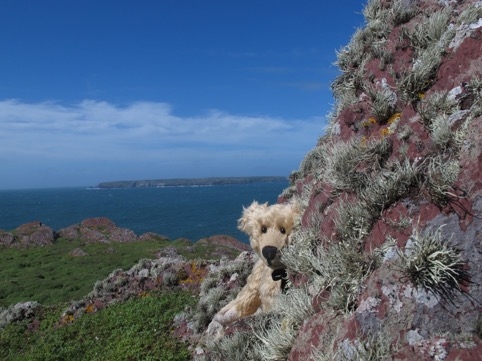 Bereavement and 2015 was the first year that Bobby had not even got to Wales let alone Pembrokeshire. There was a solution. Skomer is managed as a pair of islands. Its sister is Skokholm Island. More remote, less accessible. A holiday rather than a working trip. Ronald Lockley”s “Dream Island” A future blog will go back to Skomer. A beautiful island of memories and friendships made. But this is about a new adventure . Getting to know Dream Island. Not an inclusive article but just a personal journey in August this year. Just five days of torrential rain, gales, sunny days and beautiful clouds. A time for birdwatchers but also anyone who finds solace in the natural world. Skokholm is inextricably linked with Ronald Lockley. A keen ornithologist He lived on the island on his own in the 1930s. His is a story of survival, a bit of luck, and a study of seabirds that eventually made him a big influence to those famous naturalists who have followed and become household names. In his time Skokholm became Britain’s first bird observatory and the knowledge he gained is used to this day. He wrote his own story in “Dream Island”. Continuing to become a famed writer and travelling the world and its islands. Bobby always took me to Pembrokeshire but couldn’t take me to Skomer. Apart from normal travel gear you have to take all your own food. But….. he took me to Skokholm. I was there for the gales, the rain, the sunshine, the birdwatchers and Richard and Giselle. The wardens of Skokholm Island. I even interviewed Richard for this article. I saw how Skokholm is once again a bird observatory. Issuing daily blogs on the birds recorded. Saw how birds are trapped in heligoland traps and mist nets. Are ringed and checked for condition. Knowledge that goes to central data bases that lead to what can be seen as the health of the planet and the human race. Its inspiring that we have people dedicated to studying our wildlife for the benefit of all of us. Bertie… Richard Brown, warden of Skokholm Island. Thank you for agreeing to be interviewed by a bear. Is this your first time? Have you got a bear? How do you pronounce Skokholm? SKOK as in SOAK or SKOK as in SOCK. Richard… Errr no I have never been interviewed by a bear. Have never had one. But do have a leopard called Spot. Skokholm is as SOAKholm. (Scandinavian names revealing another story about Pembrokeshire for another time). Bertie… Bobby’s ex wife had a dog called Rover. Nearly as imaginative as Spot. And you, Richard are my first interviewee. Where did you come from? When did you first become interested in natural history? Was anyone a big influence in your young days to foster your interest? Richard… My dad has been a big influence. Some teachers were too. Mr Grassholm and Mr Bellamy. I joined WATCH, the junior branch of the Wildlife Trusts, (www.wildlifewatch.org.uk) and went on adventures, field trips and visits. Won badges. Bertie… I bet your dad is proud of you. But you still had to earn some money eventually. Any interesting jobs? Are you kidding? Mr Grassholm? (another Pembrokeshire island). Richard… He is. I worked in a burger factory and learned an important lesson looking at people who had worked there for 30 years. That was his name. Bertie… What! … to use Diddley’s language f…… me! 30 years looking at burgers? No way… And so you came to find that islands were your destiny. When Bobby first met you on Skomer he says you were a bit of a lad. You have worked on three islands now. Skomer, Bardsey and Skokholm. Which is your favourite? Richard… No comment….. Skomer was wonderful when I was there. Bardsey was wonderful when I was there for five years. And now Skokholm is wonderful. I was lucky the opportunities came at a time in my development that was just right timing. Bertie… And you took those opportunities. So it isn’t just luck. And you met Giselle on Bardsey. A beautiful birdwatcher with the surname EAGLE. What more could you want? Mind you, when the two of you made national news as two starstruck lovers destined to live on your own on a wild remote island, you didn’t mention people like me or the birdwatchers, the researchers and so on that you would be sharing it with. Richard… Well, it’s a good story. There are a lot of birdwatchers here this week. But, we get just as many photographers, painters and people like yourself who just love living on an island close to nature. At the beginning and end of the season we are alone. Love all the people who stay and look forward to the end of the season when we have a time on our own again before we leave in November. Bertie… So, Richard, do you have a plan for the future beyond Skokholm? Richard… We all think about the future but for now I couldn’t be happier on this island and love what can never really be called a job. It’s far more than that. Bertie…. Thank you Richard. You have given me food for thought in my own life and those privileged to stay on Skokholm . I hope you and Giselle stay forever. Its been a privilege interviewing you. Richard & Bertie enjoying their chat. This week’s candle is lit in St Nons Chapel, on the Pembrokeshire coast near St Davids. A wonderfully serene little building of modern times built in a traditional style. Looking across St Brides Bay to Skomer island. A retreat next door. Sitting outside the chapel one day years ago, I asked a nun if they would accept a foul mouthed, hilarious, alcoholic, hell raiser for a week or two. Or even longer….. “My dear, if she comes in peace she will be made most welcome”. Diddley thought it quite expensive to be that peaceful but not be allowed to swear all week. Or drink. The Lighthouse. Home for Richard and Giselle. Love it Bertie, hopefully the first of many! Thanks Richard …..could you mention it on yours and share the link? A joyfully written, evocative and charming little tale, Bertie, you much travelled bear – particularly on a day full of such wonderful and happy memories. Keep thinking a lot and give our best to Bobby. I have loved staying on Skokholm. Lovely to see the photos of dream island. Bertie looks quite at home there. You set the scene so well great reading. Well done Bob. Lovely meeting you, Bertie and your grandadoughter at London South Bank Love Festival. Great blog and I look forward to reading more. So happy to have found you again Bertie! We loved your company on Skokholm, and are now able to re-live those happy days by reading this most excellent blog.